Edith Hunter died Saturday at her home in Weathersfield. Hunter was a writer, historian, homesteader and a VPR Commentator. She and her late husband Armstrong Hunter published the Weathersfield Weekly, a local paper, from 1971 to 1986. Through the last days of her life, Edith Hunter retained her engagement with the world. She hosted a local history event; she looked after her 20-month-old great grandchild. She produced two commentaries for VPR in April. In this commentary, on the coming of spring, Hunter said that although the end of winter was in sight, her soapstone stove was still going full tilt. "I thought I would make some hearty winter soup at least one more time," she said. When Edith Hunter headed for the root cellar in a commentary, she tended to emerge with more than just vegetables. In this case, it’s the miracle of spring that she discovers: a soft green shoot rising from a garlic clove. The onions and potatoes were sprouting, too. "How do they know?" she wondered. "How do the garlic and the onions and potatoes sense that Mother Earth is waking up? In the cold room where no sun reaches them, somehow the first stirrings of the great awakening are felt." Hunter used the moment to ponder her own decreasing mobility and to celebrate nature, even of the indoor variety. Will Hunter, Edith and Armstrong’s son, says he and his three siblings were beneficiaries of his mother’s curiosity and sense of wonder. "She never got jaded or bored by the world," Will Hunter said. "There was always something new and interesting to find out, to share with others. She really to her core believed that our most important job is launching the next generation in ways that will people the world with people who will do the right thing and sort of be a credit to the human race." Edith Fisher Hunter was a 1941 Wellesley graduate. She went on to divinity studies at Union Theological Seminary, where she and Armstrong met. In 1969 they settled in Vermont, on the Weathersfield homestead that had been in Armstrong’s family for generations. The family had a huge garden, a wood lot, cider making and sugaring, and lots of books, from which Edith quoted often. Armstrong, a printer, set up shop behind the house. In 1971 the Hunters launched the Weathersfield Weekly, which they ran for 15 years. Willis Wood, a longtime neighbor and friend, recalls that Edith did much of the reporting. "I mean astounding reporting, just shocking depth," Wood says. "You could not say anything in a meeting without reading it the next week in the newspaper. And then she started doing a lot of history." Edith Hunter’s publishing went well beyond her well-regarded newspaper reporting. She wrote numerous children’s books, including a Weathersfield history for use in local schools. Hunter suffered from congestive heart failure. 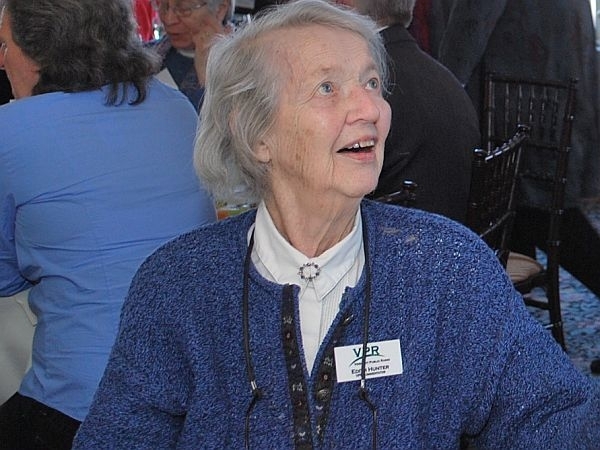 She was 92 when she died at the home she loved and often mentioned as she closed her VPR commentaries: "This is Edith Hunter on the Center Road."